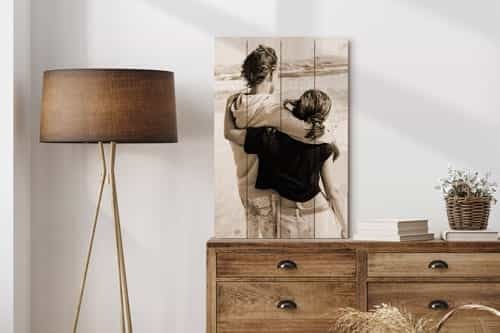 Your personal photo on wood! 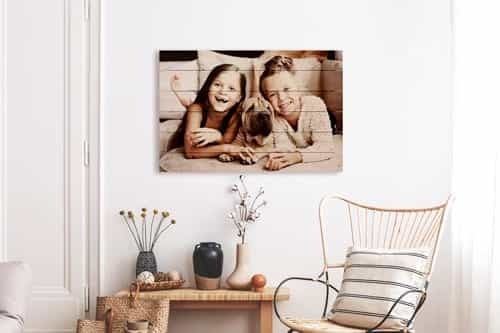 We print your photo on white­washed pine wood. As a result, the colours of the photo come out more beautiful and vivid, while maintaining the rus­tic and robust appearance of natural wood. 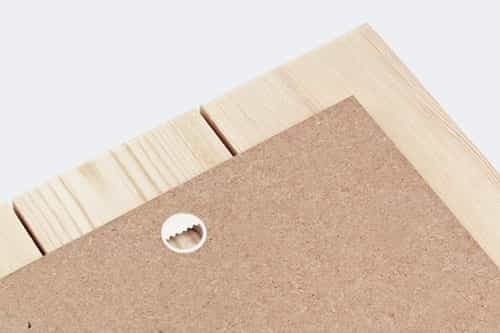 Our sustainable wooden slats are 14 mm thick and therefore do not get crooked. You can choose between vertical or horizontal slats. The beautiful, natural wood grain is visible through your image. Our wood also does not contain any knots! For that reason, you will never be annoyed by a knot in any sig­ni­fi­cant part of the picture. We always provide our products with a FREE hanging system! 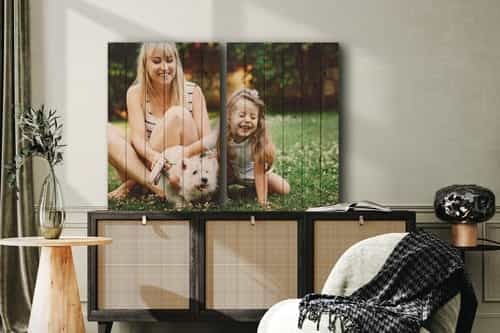 If you keep your photo on wood protected from rain, you can turn your wood print into a stylish outdoor accessory. 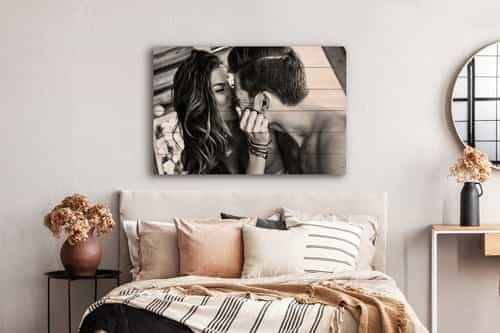 We print your photo on wood with the latest printing techniques. This will always give you the highest quality result of your photos or images. 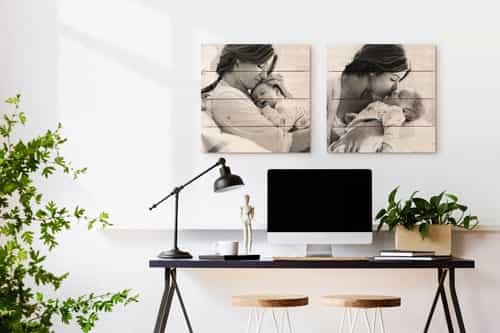 Any photo or image can be printed on wood! 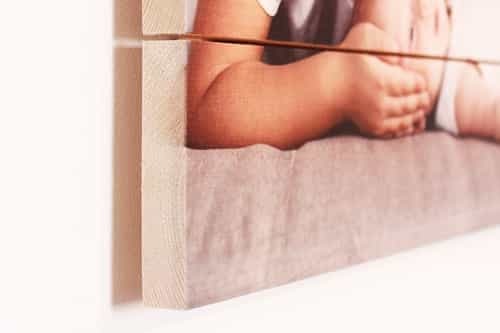 The photo on wood is often good in rustic interiors or for example in a sturdy children's room. Whitewash is a thin layer of white varnish which is carefully applied on the wood prior to printing. This gives the wood a beautiful whitewash finish that brings the colours of the print out vigorously and vividly. This technique does not compromise the robust structure of the wood which you will always see subtle. There are always various sizes of our photo on wood on sale. Be quick to benefit from those offers! Maybe you already noticed that we are the cheapest in Europe but in the meanwhile we also have a huge passion for quality. Because we use the latest printing techniques, we dare to claim that we deliver the best quality at low prices! Ordering your own photo on wood is super easy. You upload your photo or image, choose the desired size, slats orientation and the cropping. Then, you only have to fill in your details and proceed to payment. It is so easy, isn't it? Plus, your photo will be delivered to you at home within 5 working days! Do you have any questions about the photo on wood? Please do not hesitate to contact us, we will be happy to help you with a lot of passion!